Published in the May 2015 issue of Frieze Magazine, click here. Given the significant attention in the press release to a video that promised to allude to the political situation in Guerrero, Mexico, where in September 2014, 43 girls were killed with the complicity of the local authorities, it was surprising that no such video was on view in Take Position: Bodies and Plants, Mexican-born artist Ana Roldán’s solo show at Annex 14. The work seemed as if it might play an essential political role in an exhibition exploring various aspects of ‘position taking’ and with a title, at least partially, bearing a similarly political edge, yet for unexplained reasons, it could not be shown. What was on view included four groupings of works exploring more formal aspects relating to the title’s theme and examples. 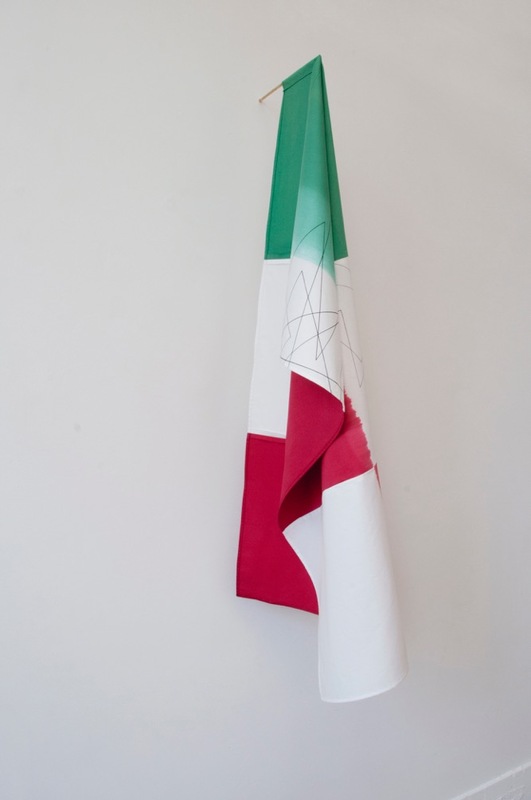 False Flag (all works 2015), In the same colours as the Mexican flag, and it seemed an ironic symbol of a degenerating democracy and a failed state, where the types of crimes like that in Guerrero have become tragically common, and where government not only does not manage to protect its people, but in many instances is complicit in violence against it. Linguistic games and spacial aspects of positioning followed. White posters (Vanilla Overseas), were seemingly randomly plastered across a vanilla-coloured U-shaped wall, with various synonyms of the word ‘position’ – such as stance, posture, attitude –printed in black and placed at different angles. 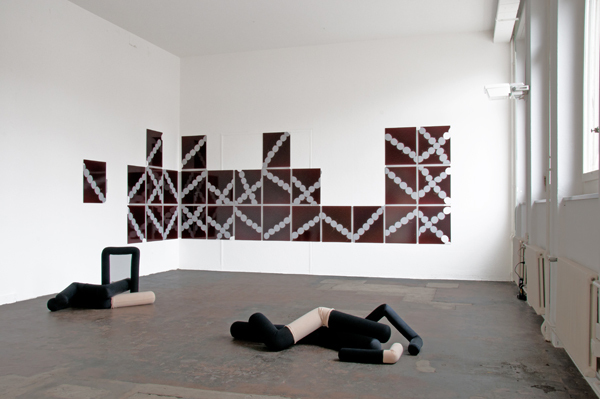 These posters formally connected to the other works: three floor sculptures (I thought it was impossible, I–III) of cylindrical foam parts arranged in configurations resembling human bodies and also placed at conflicting angles as the writing on the posters, and a series of thirty photograms (Indian file, 1–30) of coconut imprints aligned in diagonals and X’s, installed to create random patterns. The foam cylinders, complete with skin-toned socks of I Thought it was Impossible I-III brought to mind Hans Bellmer’s dolls, and might also have alluded to dismembered or wounded bodies of protesters, lying on the streets in contorted positions, a fitting link between the flag and current events, thus offering the exhibition more relevance, and saving it from a complete collapse into mere formalism. The connection and conflict between the natural and the artificial worlds was made clear in Indian File, where images of coconuts are naturally recorded through light-exposure ontophoto paper, a man-made medium, and a loose link between the natural skin-tones and artificial material in the sculptures was also established. Yet the relationship between intellectual and physical stances, between the worlds of bodies and plants, was less clear – as was the artist’s actual message on the topic. In the various ways of dealing with poses, stances and positions, then, unfortunately most seemed tritely formal, and only tangentially political – reflecting the artist’s quandary of transitioning from idea to action in politics, perhaps. The gap between signifier and signified in the move from word (on the posters) to object (of the sculptures and photograms) seemed just an exercise in semantics. Despite the merits of the sculptures, which are indeed engaging and even humorous, the essential message of the artist about the connection between politics, bodies and plants in a time of profound world turbulence, remained superficial or possibly just too concealed. Maybe the video was important after all.